The weather was as kind as it could be during the Jubilee celebrations in Westerham, with the rain holding off more or less during the Big Lunch on Sunday. Westerham’s Restaurants set up up The Green and townsfolk enjoyed the music from The General Wolfe Sunday night regulars, father and son Geiger, accompanied by Richard Woolnough on the drums. There was a dance display from Jam, and Punch and Judy, but sadly Kiddies’ sports was cancelled due to slippery grass. The skies cleared for the AbbaMagic concert on Monday, which attracted a large and enthusiastic crowd, the Scouts provided a BBQ and the evening was topped off with Fireworks and the Lighting of the Beacon by the Sea Cadets on the North Downs. Pubs in Westerham hosted a variety of events, all with music, and various streets held parties. The whole weekend was filmed by a TV crew from France3, who wanted to broadcast a snapshot of a small town’s celebrations. For the This is Kent Westerham Jubilee report go to This is Kent story. Click for the main programme. Click for the Coronation memories of Westerham. Retailers throughout the town will display items fit for a Queen in their shop windows. Collect an entry form from the Westerham Flower Shop and see how many items you can discover. Family fun, prizes to be won. All children will be involved in creating a giant time-line which will show the 60 years of the Queen’s reign. Each year group will focus on one particular decade and this will be available for all to see as part of our annual school celebration event in July. 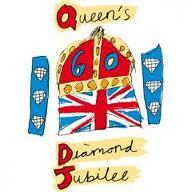 We will be holding a school Diamond Jubilee picnic on Friday 1st June and all the children will be invited to dress as Kings or Queens for the day. It’s going to be a lot of fun and something that the children will always remember. Every child will receive a commemorative gift. Join us in The Royal British Legion to celebrate our Patron, Her Majesty Queen Elizabeth’s, Diamond Jubilee! Everyone is welcome, it’s Open House with a free buffet. Live music by ‘Shades of Green‘ a four man instrumental and vocal Group. As part of the celebrations throughout the nation. Westerham restaurateurs will set up stalls around The Green to sell meals of various specialisations from 11.30am to 3.30pm. A BBQ, Indian, Italian, Thai and Chinese fare will be available, as well as ice creams and scones. Tables and chairs will be provided. There will be plenty of entertainment for the children including fairground rides, Punch and Judy and a variety of musical and other entertainers will all be there for your enjoyment. Children’s sports start at 2.30pm. The Green will be decorated for this historic occasion, so come along, celebrate the Queen’s Diamond Jubilee in style and good company and bring your friends and neighbours too! Over 1000 boats will muster on the River Thames in preparation for Her Majesty to take part in The Thames Diamond Jubilee Pageant. It will be one of the largest flotillas ever assembled on the river, and the formal procession will take place between 2 – 6pm. 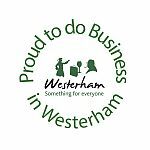 Westerham Club will show the event on their 55″ and 58″ HD screens, and this will be followed by Live Music from Jason Melville from 7 – 9pm. Cheapest beer in town – the Club is open to the Public for the whole weekend. Live Music featuring The Licks, BBQ, Market Stalls, Lots of Children’s Games. St Mary’s will be open all weekend! Everyone is welcome to visit the wonderful Jubilee themed display by the Flower Guild. There will be a veritable multitude of flowers in every corner of the Church, all adorned with diamonds and crowns to celebrate Her Majesty’s weekend! Westerham and Sundridge Bell Ringers are intending to complete a Quarter Peal of Grandsire Doubles on Saturday 1st June. St Mary’s, St John’s RC Church and the Congregational Church will be holding a joint Songs of Praise service at St Mary’s at 6.30pm on Sunday 3rd June. Hog Roast and Live music from ‘Blondee’ in the garden of The King’s Arms. Tickets from Reception. Abba Tribute Band, AbbaMagic, will be a free entry concert in King George’s Field. A running BBQ, hot dogs, tea, coffee and cakes will be provided by the Scouts and the Westerham Sports Association will be open for drinks. Gates open 6.30pm – come and make a night of it, and stay to watch the Beacon and Firework display afterwards! Westerham Scouts lit the massive beacon above Westerham on Monday, 4 June, as part of the Queen’s Jubilee celebrations. 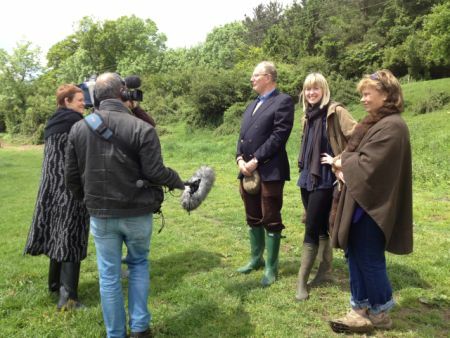 Arranged by Tim Saunders, John Warde of Squerryes came along too to watch the event! Click for report, pictures and more information. Squerryes Estate will light a Beacon soon after 10pm, as the Concert ends, as part of a chain of thousands throughout the world to commemorate Her Majesty The Queen’s 60 year reign over the UK and as head of the Commonwealth. It will be on high ground to the north of the town, clearly visible from King Georges’ Field. A spectacular show of Fireworks will round off the evening. French film crew discussing the lighting of the Beacon with John Warde and his French daughter-in-law. There is great tradition of decorating buildings to mark jubilee celebrations. Quebec House was decorated by the tenants on many occasions during the 20th century. We’re reviving this tradition this year as we decorate the outside of the house with bunting, flags and lights to mark the Queen’s Diamond Jubilee. The house is open (12-5) throughout the Jubilee Celebrations with extra open days on bank holiday Monday and Tuesday. Although we’re closed evenings come and marvel at night to see the lights at their best from the road. A Jubilee Champagne Breakfast will be served, at The Grasshopper on The Green. The menu will include full English Breakfast, and other luxury choices fit for a Queen! Indulge in Smoked Haddock and Spinach, Smoked Salmon, Scrambled Eggs ..even Strawberries and Cream – the choice is yours – all topped off with a glass of Champagne to celebrate Her Majesty’s Diamond Jubilee! £20 per head booking essential. To celebrate the anniversary of Queen Elizabeth II’s historic 2012 Diamond Jubilee, the Woodland Trust is helping millions of people across the UK to come together to plant 6 million trees. The Royal Record to mark King George V1’s Coronation mentions Westerham’s contribution, and a Diamond Jubilee Record is planned. Valence School, which is also celebrating its Diamond Jubilee, has signed up to plant 61 trees. Bridge Gourmet Lunch raised £1580 for the Westerham Town Partnership to donate equally between the Christmas Lights and Hanging Basket funds. A very big thank you to Alison Burt and her team who laid on a superb three course lunch, and Tony Price who directed the afternoon’s play. The St Mary’s Heritage Trust Westerham celebrated Her Majesty the Queen’s Diamond Jubilee with a dinner at Squerryes Court on Sunday 10th June. The talented National Youth Ballet Company, whose dancers hail from all over the country, wowed Westerham with a very professional programme directed by Founder and Artistic Director, Jill Tookey, a local resident. With not a tutu in sight, the spirited young dancers performed a sophisticated vignette, inspired by Noel Coward and an exciting premiere of the appropriately entitled Diamonds on the Soles of her Shoes, choreographed by renowned choreographer, Antony Dowson. NYB’s own Silver Jubilee season takes place at the E M Forster theatre, Tonbridge 23rd – 25th August and their Gala at Sadler’s Wells on 2th September with a programme to delight all ages. Further details on the NYB website. As part of the celebrations to mark the Queen’s Diamond Jubilee, the St Mary’s Westerham Heritage Trust hosted a dinner and ballet at Squerryes on Sunday June 10th. The event opened at 6.30 p.m. with a champagne reception followed by a black tie dinner in a marquee in the wonderful setting of Squerryes Garden. As dinner progresses the lights dimmmed and the young dancers of the National Youth Ballet took to the stage. 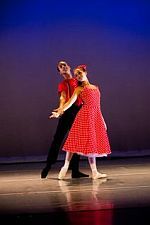 The Premiere of a new programme, “Diamonds on the soles of her shoes” choreographed by Antony Dowson was performed. Grand Dinner and Entertainment by the National Youth Ballet at Squerryes Court: ‘Diamonds in the soles of her shoes’ in Celebration of the Queen’s Diamond Jubilee was a superb evening. Huge thanks to John and Anthea Warde for their hospitality, Pauline Green for the wonderful food, and all those associated with the sparkling NYB performance. Not only was it a great evening, but it raised £4700 for Westerham Heritage Trust.